The Castlebar team celebrate winning the Jimmy Bruen competition. 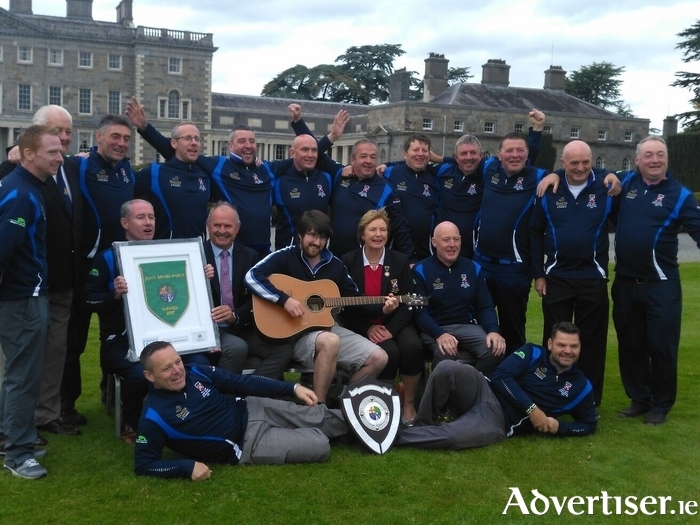 Castlebar Golf Club is the All Ireland Jimmy Bruen champion after a thrilling 3-2 win over Ulster Champions Warrenpoint on Saturday at Carton House. The Mayo club captained by John Kelly came through their semifinal on Friday in dramatic fashion with Tom Moylett and Mark Corrigan securing the 3-2 win with a birdie on the 19th hole play off against Munster Champions Ballykisteen. Saturday's final ebbed and flowed with fantastic golf by both sides. Kieran (Kiwi ) Horkan and Colin Dawson got the first point on the board for Castlebar, and with the pairings of Shane Quigley/Johan Collins and Mick Kilcourse/Dave Walsh losing narrowly it wasn't looking promising when they needed to win both matches 4 and 5 to claim the title. Moylett and Corrigan got one back for Castlebar with another brilliant birdie on the first play off hole to make it 2-2. All eyes then turned to the final match as Paddy Burke and Ray Prendergast held their nerve to seal the win on the 18th amid emotional celebrations for an historic victory. This is the first ever adult green pennant for Castlebar and interestingly they become only the third Connacht club ever to win the Jimmy Bruen Shield.